Q: Avoid The Most Common Buyer Errors ? A: Some buyers, however, caught up in the excitement of buying a new home tend to overlook some items. When you have a systematic plan before you shop, you’ll be sure to avoid these costly errors. Here are some tips on making the most of your home purchase. Q: What if I want to buy a piece of land on the sandy beach and build my own villa? The government's policy is that land on a sandy beach is reserved only for tourism and/or commercial development. However, we can help you to find villas that may be within resort communities on the sandy beach of your choice and can advise you on which might meet your purchase criteria and planned usage at each resort. Or we can showcase to you property on a dramatic rocky coastline, cliffside, or inland with spectacular beach views. Q: Now that you found me my trophy property in Anguilla paradise, how do I proceed? If we are working together, you will know that we are here to help you every step of the way. You must obtain an Alien Land Holding License from the Government. If the application is for undeveloped land then Planning Permission is required of the proposed building before an application for Alien Land Holding License can be submitted. Planning Permission is obtained from Lands and Surveys - Planning Board. The License application would be completed by you and submitted to Government in duplicate with the required fee. We can provide you a copy of the application as well as the required additional personal documents if you would like to review it now so just contact us. At Lands & Surveys the value of the property is established and noted on the application and then forwarded to the Registry office where it is then taken to the Chief Minister's office. A brief interview with someone from the Chief Minister's office is also required. The Application is then forwarded to Executive Council for discussion and decision. Once it is approved, the Applicant is notified from Government in writing and it would also include the amount of taxes due. This process usually takes about 2-3 months. Q: I like Anguilla but also want to compare it to other islands, can you help? Yes, we have an affiliate that represents most islands in the Caribbean and they can precisely help you determine which island and property best fits your requirements. Just contact us and we will put you right in touch with the experts. A: Buying a home can be an emotional, time-consuming, and complex process. There are a few things that you can do to help make the process go as smooth as possible. Q: Am I permitted to rent my villa to tourists? Yes you can rent your villa and many owners find this a good way to help offset costs when they are not using the property. When purchasing a villa the buyer designates if it will be a villa only for their private use or if it will be a rental villa. An annual fee for renting is required and is based on the square footage of the home and deck space. Please feel free to touch base with us on the fees which currently vary based upon the villa size. Q: How can my rental property be managed when I am not on Island? 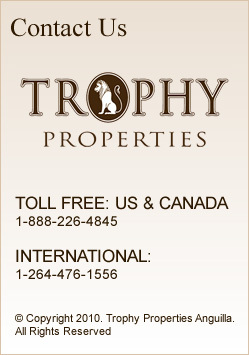 Trophy Properties would be delighted to speak with you about how we can handle this for you. You can focus on enjoying the property and we will ensure that all of the ownership tasks are handled professionally and to your specifications. Please contact us for additional details as we can customize the agreement to suit your needs. Q: How much land does the government permit me to purchase in Anguilla and there any restrictions? 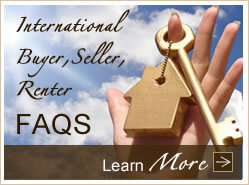 Foreigners are allowed to purchase up to .5 acre for building a villa. There are sometimes exceptions made to this standard but this is the general rule. Feel free to speak with us about your needs and we are happy to guide you accordingly. The government also wishes to ensure that the property will be built in a timely manner so they currently guide buyers that construction needs to be completed within 18 months from the date the License is issued.